Hanwha Techwin has strengthened its range of Intelligent Traffic Management solutions with the introduction of Wisenet Group ANPR cameras. Taking advantage of a powerful chipset, Wisenet Group ANPR cameras are an ideal edge-based solution for small sites with multiple entrances/exits or roadways. Hanwha Techwin accelerated its programme to integrate Wisenet X cameras with leading VMS solutions such as Genetec Security Center 5.6 and Milestone XProtect®. 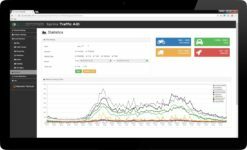 The ability to detect incidents and keep traffic on the move has been significantly enhanced as a result of the announcement that Sprinx Technologies’ Automatic Incident Detection and Traffic Data Collection (AID) application is now able to run onboard all Hanwha Techwin Wisenet X H.265 cameras. Bob (H.Y.) Hwang Ph.D., Managing Director, Hanwha Techwin Europe, explains the thinking behind the theme ‘WE MOVE with trust’. Hanwha Techwin’s entire range of cameras and recording devices have been successfully integrated with SureView’s Immix CS central station software platform.